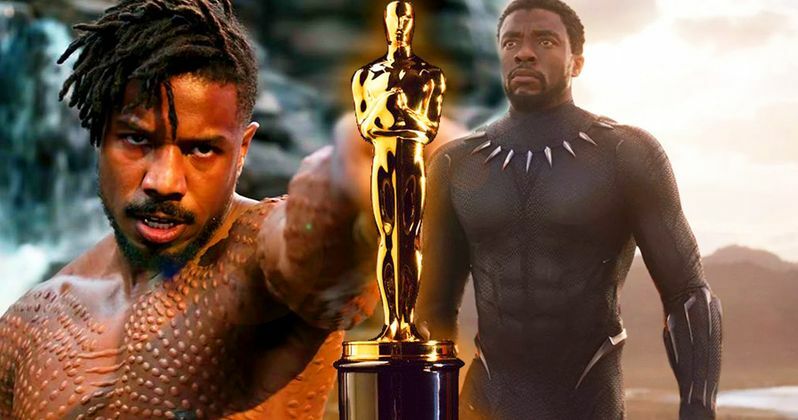 In the hours since the Academy of Motion Picture Arts and Sciences announced that Marvel Studios' Black Panther was among the nominees for Best Picture at the 2019 Oscars, a good chunk of the Internet has been in an uproar. For some, this was great news, bringing a great deal of representation to the Academy Awards, while also making history as the first superhero movie to ever be nominated for this award. For others, this Oscars Nomination was "outrageous," as many people considered Black Panther to be just another mediocre superhero movie. Numerous people spoke up, saying that it only received its nomination because it was the first prominent black superhero movie in decades. However, despite all of these remarks, Black Panther does actually deserve this nomination for Best Picture more than nearly every other superhero movie. While it may have been "mediocre" as a superhero movie, the thematic elements of the movie made it into something much more. The complaint that the movie only received its Oscars nomination because "it was black" is actually a fair analysis, sort of. On the outside, Black Panther was an entertaining Marvel movie, with a fantastic villain, a compelling superhero, cool effects, a killer soundtrack, a star-studded cast, and a whole lot of action. However, within that, there was an incredibly deep thematic narrative. The movie didn't just star a black hero - it was a story about the struggles that black people have had to suffer through for centuries, with an intriguing commentary on racism and prejudice put in there as well. The best way to pinpoint this thematic narrative is through Killmonger, the villain whose motivation was to fight the racism that has plagued the Earth for so long, but in the wrong way. T'Challa, on the other hand, ignored the racism in the beginning, not seeing it as his problem. In the end, T'Challa decided to listen to Killmonger and stand up for the people who were hurt by racial injustice across the globe, but would do it in his own way. While Black Panther was definitely a superhero movie, the entire movie was actually a debate about racism and how it should be addressed by the leaders of the world, which is something we have never seen before in a superhero movie (except for some of the X-Men movies, but those used analogies rather than calling out race specifically). Another clear factor of why Black Panther is deserving of its nomination is how much it resonated with audiences. While Avengers: Infinity War may have earned more than Black Panther globally, Black Panther was much more successful domestically. Black Panther was more than entertaining - it was inspiring. Unlike most other superhero movies, Black Panther actually touched lives, bringing hope and motivation into the hearts of some people who thought that they couldn't make a difference. Movies that inspire hope are truly among the best of the best, and are part of the reason why film is still seen as such a valued art form. While there will surely be many people that will still consider Black Panther to be overrated and undeserving of its nomination from The Academy, these are likely people that were not touched by Black Panther in the way that others were. Whether you realize it or not, Black Panther was one of the most impactful movies of 2018, and undoubtedly deserves this nomination simply due to its thematic narrative and inspiring message, in addition to how fantastic the production was as a whole.